BUSOG! SARAP! : BRISBANE FILIPINO BARRIO FIESTA 2014 …. BRISBANE FILIPINO BARRIO FIESTA 2014 …. It’s the time of the year to celebrate our very own Filipino Barrio Fiesta in Brisbane! I heard from the grapevine, it will be bigger and better than last year with more entertainment and car park spaces as the Rocklea Showgrounds venue is huge!!! So if you’re base in Brisbane or happen to be visiting during the 8th of June, please drop by for a fun filled day. Of course I’ll be there to tend to our TSIBOG CAFE stall…..see you all there! 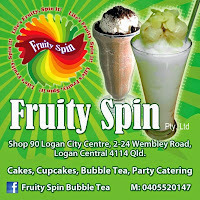 Oooh, I almost forgot….you better visit Fruity Spin for those tasty drinks and scrumptious cakes slices they have available in their stall. They also have those yummy “Potato Spin” on a stick!